Gray Elementary School was named for the Gray Family who homesteaded on Gray Road, which is now 80th Avenue. The Gray homestead was located on the North side of the road somewhere West of the Shannon apartments. The Gray family consisted of four members. Rober Senior and Adeline were the parents who framed the original homestead. The children, Robb and Samuel, were also actively involved in the farming activities. The land on which Gray Elementary School sits was a large pig farm in the 1950’s and 1960’s. The site was purchased by the Delta School Board from Mr. S. Hoon in 1959. 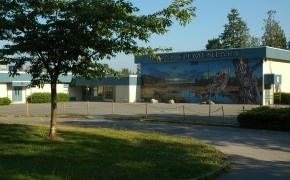 In 1970, the Delta School Board exchanged 3.08 acres with the Municipality of Delta so as to ensure that the school was located on a higher elevation of land. An eight-room school building was constructed and opened in September 1970. Four classrooms, plus a gym, were added in 1971. Subsequently, sixteen more classrooms were added between 1972 and 1974. the first on-site principal was Robin Randle.